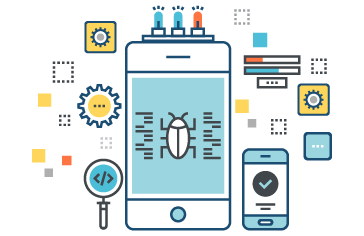 Mobile functional testing is fundamental to any mobile app testing practice – it is tests that the software works as it should. Testing that the design and requirement specifications have been met. This is testing created from the perspective of the end-user of your app. Various Version of OS like iOS 11.x, iOS 10.x, Android Pie and Android Oreo etc. Testing Multitude Mobile devices (Smartphones, Tabs, and IPad. etc.) with different screen sizes and hardware. 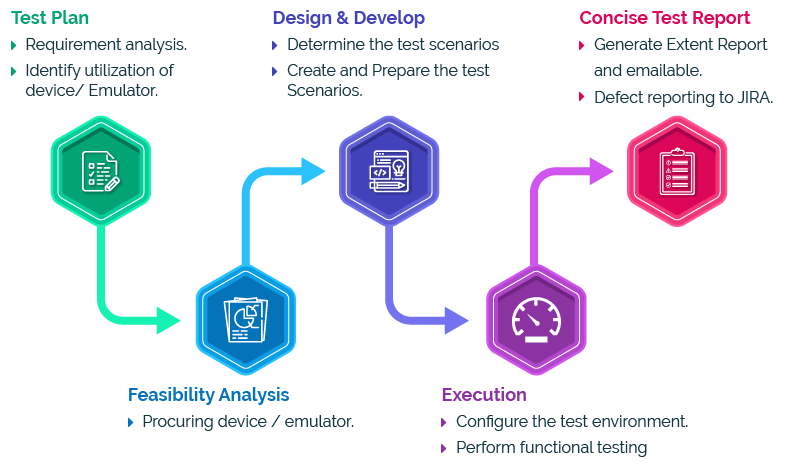 Royal Cyber has experience in providing a host of tests for Mobile devices such as Performance, User Interface, Compatibility and Functional Testing. Royal Cyber Mobile Testing team has strong expertise in testing various mobile apps – native, web, and hybrid, and keep themselves abreast with the latest methodologies, mind maps, and checklists based on platform updates. Our test automation solution aims to simplify the entire process of testing on a wide range of mobile devices. Selenium : is the most popular open source tool for test automation on desktop browsers. It supports multiple programming languages and platforms. Appium : is an open source test automation tool that works with Selenium and enables automation of native, hybrid and mobile applications on IOS and Android platforms. Royal Cyber TEAF : (TEST AUTOMATION FRAMEWORK) integrates with Selenium, Appium and Galen to provide a robust and highly simplify approach to achieve automated testing on desktop and mobile with ease. TEAF enables QA teams from different domains to achieve dependable test automation allowing faster QA and thereby faster time to market. Cloud based Tools : Instead of maintaining a large list of latest mobile devices that changes over time, we work with popular and effective cloud based device providers such as Browserstack, Saucelabs, Perfecto & AWS to achieve testing on wide range of user devices. Automatic UI validation are now possible with open source tools such as Galen, which further enhances the test automation coverage and speeds up the testing process. Open-Source test automation framework for mobile testing.